The Serial Number, Model Number and Voltage information from your Data Nameplate. Your phone number and possible times to reach you during business hours. A description of the problem you are having and anything you have done so far to troubleshoot it. You will get prompt, effective, and detailed expert answers. We are committed to answering service emails within one business day but normally they are answered far more quickly. If you need a phone call we can help you better if we have this information before we call. Note about element resistance values: You can find the proper ohms for your elements on the wiring diagram which comes with your instruction manual. 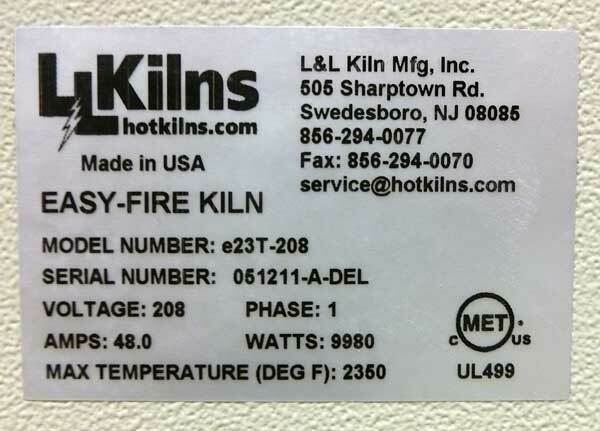 This is a Data Nameplate that you will find on your kiln. Obtain the Serial Number, Model Number, Voltage, Phase, Amps and Watts for your email for quicker better service. This kiln was manufactured in May of 2011. Be sure to get your wiring diagram if you don’t have it. You can get this emailed free from our office if you know your model number, serial number and voltage. This is the key to understanding what is happening electrically and it makes a great visual reference to share with the tech support department over the phone. Get a “Digital Multimeter”. Digital Multi-meters are inexpensive. For around $50 or less you can get one at a place like Radio-Shack or Home Depot. Get one that can test at least 250 volts AC and 28 volts DC, also ohms from 0 to 200, and is able to show at least the tenths decimal place for accuracy. See this tutorial in how to use a multimeter. Sometimes you may need get an electrician or experienced person, to test live electricity if you cannot. If you get someone to provide on-site service, the kiln must be hot and exhibiting its problem when they test it. Sometimes it is difficult to coordinate the electrician, a hot kiln, and our technical support on the phone all at the same time, but it can be necessary to make the most of the electrician’s time, and to fix the kiln in a timely fashion. It is usually best also to discuss with our technical support department the date and approximate time an electrician is expected to arrive. As a practical matter the technical support staff is limited by the fact that we are at a distance from your kiln, communicating by email or telephone and are often working with you through multiple sessions to fix your kiln’s problem. We rely heavily on your accurate and complete description of the problem, and your responses to our questions. We rely on you to remember where we are in the process of fixing your kiln each time we talk. (Email is easier because there is a recorded thread of communication). Distributors often offer a degree of application support. For instance if you are having problems with firing your work the first place to go for answers is the people who supply your clay and glazes. We offer some application support on this web site but it is minimal. Generally, this is outside the scope of our service. Look at the External Links for many great sites that can help you. You can also email Rob Battey or Jeff Zamek who do independent consulting for ceramic application issues. We have found through long experience that is best when trouble starts to replace all of a certain part. If your elements are old and one burns out – change the whole set of elements. The same is true for thermocouples, thermocouple wires, element terminal screws, power cords, and contactors. Do not expect control panel components to reliably perform after 15 or 20 years. The heat of kilns causes unavoidable oxidation of electrical components - some that you can't see. Kilns need to be rebuilt occasionally. Changing JUST the part that is causing the immediate problem is just asking for more trouble in short order.